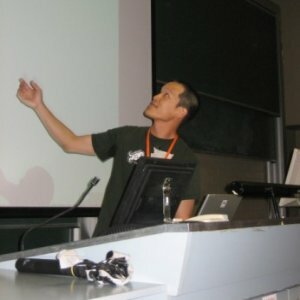 Linux.conf.au was pretty cool – there were OLPCs to play with, faces put with names (and nicks), an awesome Open Day full of shiny demos, and a luncheon pilgrimage to the Red Hat Noodle Bar. I gave a talk about superswitcher at the GNOME miniconf. It wasn’t the sexiest topic, and I was a little nervous (I haven’t really done a lot of presenting before), but I don’t think it sucked. It was a better experience than one I had a few years ago, when it was really cold, and my hands were stiff and frozen just before I had to get up on stage, so I thought to run some warm water over my hands, only to turn the tap on far too fast, and the splash gave me a nice big wet patch right over my groin :-). Unfortunately, the video appears to be lost. There are OGGs of Davyd’s introduction and t-shirt handing out (trust me, it’s not that interesting) beforehand, and the Avahi talk afterwards, but not the one of me. So much for my 15 minutes of fame, but really, there wasn’t a lot to it (if you want to find out what superswitcher does, just download and try it). At least Davyd took a photo. Finally, Enso was just released, albeit Windows-only and trial-ware (yeah, they gotta eat). From my biased viewpoint, it looks sort of Deskbarish (they mention Python plug-ins! ), sort of Superswitcherish (they switch windows by find-as-you-type title search, and they trigger on Caps Lock! ), sort of Quicksilverish (Santa is still yet to gift me a BlingBook Pro), sort of Google Desktop Ctrl-Ctrl-ish, surely sort of other things I haven’t seen yet, and heavily influenced by the late Jef Raskin’s The Humane Interface (certainly interesting reading for UI designer wannabes, especially those who want to get away from the “nothing’s changed since the 90s, overlapping windows, files and folders, icons on a desktop” rut). The Flash demos are all very flash :-), although I don’t really see the life-changing-ness of being able to calculate anywhere (maybe I just wasn’t cut out to be an accountant). The “learn as” feature seems nifty at first glance (although if it’s just files or URLs, you could simply just bookmark them in Nautilus or Epiphany and pick them up in the Deskbar). Update (2007-01-29): Terry didn’t win, by the way, but he still made the news. Apparently he “is a true-blue Australian with a fondness for meat pies, football, cricket, and our easygoing, honest, and relaxed culture”, despite me being unable to remember the last time he ate a meat pie, watched the footy, or the cricket. He is, however, easygoing, honest and relaxed. Just a short note to say I’ll be at linux.con f.au in Sydney next week. Drop me a line if you wanna meet. I don’t have much else to write about, so instead look at Drew Kerr’s Gimmie / panel menu musings.